(Nanowerk News) Stacking two solar cells one over the other has advantages: Because the energy is “harvested” in two stages, and overall the sunlight can be converted to electricity more efficiently. Empa researchers have come up with a procedure that makes it possible to produce thin film tandem solar cells in which a thin perovskite layer is used. The processing of peroveskite takes place at just 50 degrees Celsius and such a process is potentially applicable for low cost roll-to-roll production in future. What is true for double-blade razors is also true for solar cells: two work steps are more thorough than one. Stacking two solar cells one on top of the other, where top cell is semi-transparent, which efficiently converts large energy photons into electricity, while the bottom cell converts the remaining or transmitted low energy photons in an optimum manner. This allows a larger portion of the light energy to be converted to electricity. Up to now, the sophisticated technology needed for the procedure was mainly confined to the realm of Space or Concentrated Photovoltaics (CPV). These “tandem cells” grown on very expensive single crystal wafers are considered not attractive for mass production and low cost solar electricity. The research team working under Stephan Buecheler and Ayodhya N. Tiwari from the Laboratory for Thin Films and Photovoltaics at Empa-Swiss Federal Laboratories for Material Science and Technology has now succeeded in making tandem solar cells that are based on polycrystalline thin films, and the methods are suitable for large area low cost processing ("Low-temperature-processed efficient semi-transparent planar perovskite solar cells for bifacial and tandem applications"). Flexible plastic or metal foils could also be used as substrate in future. This marks a major milestone on the path to mass production of high-efficiency solar cells with low cost processes. The secret behind the new process is that the researchers create the top solar cell perovskite film with a low-temperature procedure at just 50 degrees Celsius. This promises an energy-saving and cost-saving production stage for future manufacturing processes. The tandem solar cell yielded an efficiency rate of 20.5% when converting light to electricity. Already with this first attempt Empa researchers have emphasized that it has lots more potential to offer for better conversion of solar spectrum into electricity. 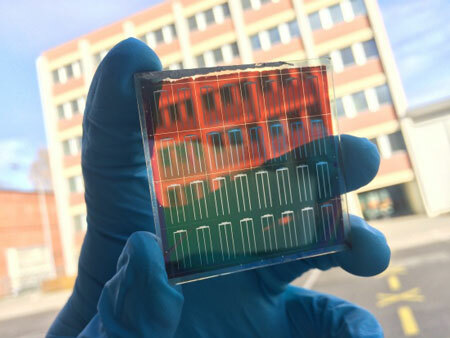 The key to this double success was the development of a 14.2% efficient semi-transparent solar cell, with 72% average transparency, made from methylammonium lead iodide deposited in the form of tiny perovskite crystals. The perovskite is grown on a thin interlayer made of the substance abbreviated as PCBM (phenyl-C61-butyric acid methyl ester) is used . Each PCBM molecule contains 61 carbon atoms interconnected in the shape of a soccer ball. The perovskite film is prepared by a combination of vapour deposition and spin coating onto this layer, which has tiny football like structure, followed by an annealing at a “lukewarm” temperature. This magic perovskite crystal absorbs blue and yellow spectrum of visible light and converts these into electricity. By contrast, red light and infrared radiation simply pass through the crystal. As a result, the researchers can attach a further solar cell underneath the semi-transparent perovskite cell in order to convert the remaining light into electricity. For the lower layer of the tandem solar cell, the Empa researchers use a CIGS cell (copper indium gallium diselenide), a technique that the team has been researching for years. Based on the CIGS cells, small-scale production is already under way for flexible solar cells. The advantage of tandem solar cells is that they exploit sunlight better. A solar cell can only convert radiation with an energy level higher than the bandgap of the semiconductor used. If the radiation is weaker, no electricity is generated. If the radiation is higher in energy, the excess radiated energy is converted to heat and is lost. 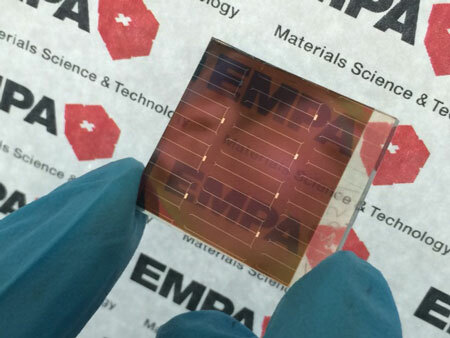 A double-layer solar cell like Empa’s perovskite CIGS cell can combine substances with differing bandgaps and thus convert a larger share of the irradiated solar energy to electricity.